Drum Diameter: 2-1/4", Base Diameter: 3-5/8", Height: 3-1/2"
Classic Winches Whether you have a smaller yacht, or are just looking for that traditional look, Andersen Classic Winches provide hallmark quality and performance in a simple non self-tailing configuration. 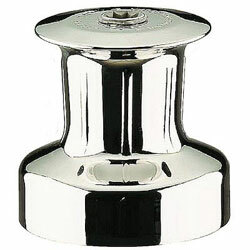 Single and two speed models, suiting conventional top mounted handles are available in sizes 10 to 46 providing a perfect economical solution for trailerable yachts and small keel boats where constant trimming is required. Traditionally styled, low profile Classic Winches are single speed and available with included base-mounted or below-deck handle configurations. They are standard equipment on many popular classic sailboats of up to 2 ton displacement, including Dragons, H-boats and Folkboats where their beautifully polished finish complements that of the craft. The single speed operation of the traditionally styled models is also ideally suited to "pumping" operation which is often required in confined cockpits. They are available in nominal maximum deck thickness models, but can also be made to order to suit custom deck thicknesses. All Andersen Classic Winches feature the Andersen Power Rib™ for safe, reliable grip and controlled release.